While most computers and even web browsers these days come equipped with spell-check and grammar-check programs, the fact remains that professional proofreaders are still highly valued in nearly all industries. A proofreader can go beyond what a traditional computer program can do, including the tasks of checking documents for printing errors, ensuring consistency between different versions of a document, and ensuring that a document has followed stylistic guidelines that have been put in place by the entity publishing the document. If you have a passion for language and enjoy, and are skilled at, improving existing documents, then a job as a proofreader might be ideal for you. Of course, working as a proofreader is something that requires a strong familiarity not only with the language in which you will be working, but of style guides and the publishing process as well. This article will walk you through some basic steps that can get you on your way to your goal of becoming a professional proofreader. The majority of companies looking to hire proofreaders these days will require a minimum of some related college coursework. This could include a degree program that focuses on publishing or even a degree in the specific language with which you will be working. For example, companies looking to hire proofreaders in English love to see a Bachelor’s degree or higher in English Language, Technical Editing, Written Communication, and other similar fields. One of the most interesting aspects of the proofreading profession is that of the symbol system that is in place for proofreaders to communicate with editors. These include a series of markings, typically made in red ink, to indicate certain changes that are proposed to be made. For example, a line struck through an individual letter in a word signifies that the letter should be in lowercase rather then capitalized. While each company may have difference expectations regarding which proofreading symbols you need to know, becoming familiar with the most common proofreading symbols and practicing them regularly can give you a big advantage when it comes to looking for employment in the field. 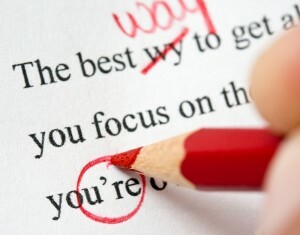 Before you begin putting out job applications, you should test your skill level when it comes to proofreading. You can do this by taking a proofreading test online. More than likely, you will be required to take a similar test at the time of any job interviews, so taking such a practice test can be a great way to gain experience and know what to expect when you are given a real test. Even if you cannot find a professional proofreading job right away, you can build your experience by offering to proofread documents for people and companies for free. After all, you can then put this on your resume as relevant experience in the field, which will make your more marketable down the road. Working as a proofreader can be a very rewarding experience, as doing so allows you to improve upon texts to make them easier for users to read and understand. Be sure to keep the above tips in mind as you embark upon your goal to becoming a professional proofreader.